Outthink The Competition - Why Read Another Strategy Book? Who Should Read Outthink the Competition: Any business, of any size, who wants to come up with new strategies to be disruptive or gain a competitive advantage. If you want to out-manoeuvre your competition then this is the go-to book. It’s highly strategic and will help you establish your multiple points of difference. This book looks at companies and the dynamics of business leaders who see opportunities where others don’t and how they have disrupted the market to their own advantage. 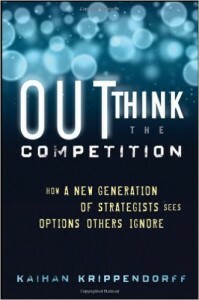 Outthink The Competition provides a framework on how to think. You will learn the strategic power of being able to see, intelligently select, and pursue new options that your competition overlooks. It gives you the processes and narratives to drive out of the box thinking. These help you to come up with strategies that are called “the fourth option”: something your competitors may not have thought of or seen. One of the most useful tools in the book are the 36 Stratagems. These strategic narratives help you create innovative and new ideas and get you out of ordinary thinking patterns. It is from here that Krippendorff helps you to develop disruptive and innovative strategies or to “uncover opportunities hiding in plain sight”. Providing a clear path to competitive advantage, this book is one of my top 5 business books of all time!